Before we dive in-depth into how blockchain in finance is transforming our society and how it will reshape the future of money, banking and the financial industry, let’s take a step back and discuss what blockchain is. Look at blockchain the same way you see an accounting ledger. However, while our current ledgers are mostly stored in centralized systems which bring along many shortcomings (as will be outlined below), the blockchain’s ledger is decentralized. In short, the blockchain is a decentralized and trusted ledger on the cloud. Since the days of old, ledgers have always been the central point where contracts, payments, assets etc are recorded. This has always been needed and useful as humans distrust each other hence the need for some sort of central governance when/if disputes arise. However, such a centralized ledger and centralized systems have some shortcomings. For example, if a financial institution that runs a centralized ledger has malicious intentions, they can easily alter figures and statements, freeze or take control of the funds of its clients. Also, because entries are done by humans, there is a chance that mistakes can be made and transaction processes are very slow. However, in a decentralized ledger system, no centralized party has the power to change entries in the ledger. In fact in a decentralized ledger like the blockchain, once a block on the ledger has been created, no one can go back to change its details. This, therefore, brings trust and arguably, no need for a centralized trustworthy entity as the participants turn to trust the machine and the codes. Blockchain in finance and banking can yield numerous benefits to society such as increased trust, transparency, efficiency and the inclusion of the many unbanked people into the financial system. Under our current banking and financial system, sending money from one bank to another, or from one country to another could sometimes take days or even weeks at very high fees. With faster options like money transfer services, fees could go up to about 20% of the transaction. These high fees and slow transaction process is brought about by the centralized nature of the financial system and the multiple middlemen involved. By using a distributed ledger technology like Blockchain in Finance, this process could be done much faster and at very little fees. This aspect of speed in transactions has seen JPMorgan, the largest bank in the US launch its own cryptocurrency. Though it runs on the bank’s private blockchain (a term we will discuss below), the coin is intended to “replace” the dollar for their international wire transfers. We have seen or heard stories of great businesses which either failed or die without any action taken due lack of funding. Sometimes, getting funding for your project in the current financial system could be a nightmare given all the bureaucracy involved in seeking for funding either through banks, VCs or even getting into an IPO. With the use of the blockchain in finance and its smart contracts feature, anyone in any part of the world can now easily fund or get funded via ICOs or STOs provided he or she has an exciting project. An ICO (initial coin offering), is a way of raising funds on the blockchain with the underlying trust mechanism being smart contracts while STOs function in the same manner though in this case, they are regulated and work more like stocks where participants receive dividends. So how can blockchain in finance help with access to funding? In 2017, there was an ICO bubble which saw startups around the world raise millions within a matter of a few hours all without the need of a mediating third party nor restricting bureaucracies determining who can participate. It is also important to note that some of these companies also included startups from remote parts of the world where a majority of their population can’t easily access loans. The current financial system is broken and works best for the financially financially well offs who know best how to beat the system. After the release of the Panama papers in 2016, many came to realize how the rich evaded taxes by laundering money into offshore accounts around the world. With the use of blockchain in finance, transactions can easily be tracked and such malpractices brought to light easily. Also, governments have the power and possibility to manipulate the value of their currencies. Though this might seem to be a good thing in certain situations, it could have devasting effects. Take Venezuela for example, the government kept devaluing its currency to the point where the country saw one of the biggest hyperinflations any country has ever seen. With the use of a “machine issuing” currency like Bitcoin, such nations, most of whom citizens have lost trust in their governments can have trust again in money as such currencies can not be easily manipulated. Not to talk about the bad faith of some bankers which led to the 2008 financial crisis. 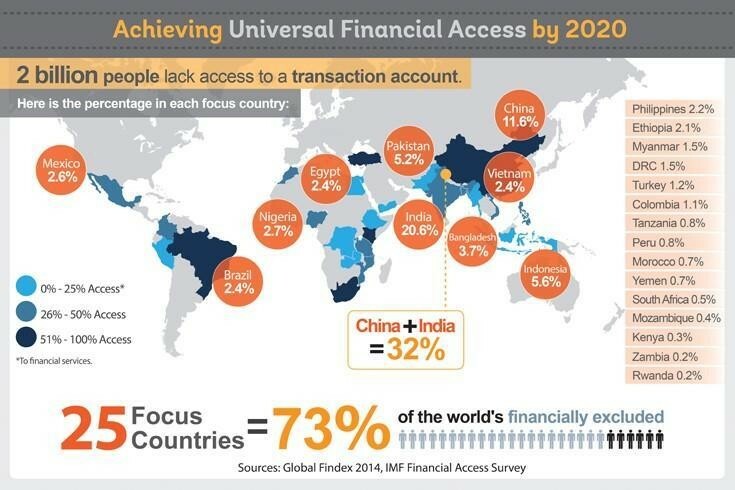 The current financial system is set up in such a way that over 1.7 billion people are left without access to financial services. Though this may not be a major problem in the western world, in third world countries, this is a major problem. Part of the reason is that these people can’t access a centralized system such as a bank is most of them live in remote areas where banks don’t find it profitable to open up operations. What about these people becoming their own banks with their bank accounts on their mobile devices? Yes, this is possible and already accessible with the use of cryptocurrencies. As governments around the world try to find ways to regulate cryptocurrencies, this means the unbanked now have a chance to participate in the global economy. With cryptocurrencies, a 55-year-old man in the most remote part of Zimbabwe can have his own bank on his mobile device. With the use of his cryptocurrency public key, this same man can get money sent to him from any part of the world and he gets the money in a few seconds. These cryptocurrencies can then be used to pay for his basic needs like the purchase of food, payment of his utility bills or he can decide to use the same cryptocurrency to invest in a project (ICO or STO) of his choice. Also, should banks decide to come up with their own cryptocurrencies like JPMorgan recently did, this can also help solve the problem as the main aim to have these people also participate in the financial system. Nevertheless, many within the cryptocurrency ecosystem believe banks issuing their own cryptocurrencies is a bad idea. Given the increasing hype around the blockchain technology, no bank wants to end up being the “Nokia” within the banking industry. As a result, many Banks are currently building and testing their own Private blockchains (a term we will discuss below) . The main aim is to make use of the speed, trust and decentralization that cryptocurrencies benefit from. Some, however, claim they are trying to remain relevant within the financial system. A private blockchain is a “permissioned” type of blockchain involving a few participants who serve as a consortium of trusted validators. This is becoming a growing trend in the banking industry with many banks either creating their own private blockchains or partnering with other blockchain projects who already run a private blockchain. However, private blockchains are still not the ultimate solution for banks using blockchain in finance. Here are some advantages and disadvantages of private blockchains currently face. Private blockchains offer a decentralized platform where information is stored and can be accessed at any time by participants alone. In this case, private blockchains can offer high-end privacy, even more private than public blockchains as no permission means no access to information or no participation. Due to the fact that all information and transactions are cryptographically encrypted, the entire system is safe and secure from an attacker. Also, the validators are well known by the participants so the risk of a 51% attack from an attacker or a miner is not possible. With the use of private a blockchain in finance and banking, bank transactions which normally take days and weeks can now be executed within a few seconds as most of the huddles and bureaucracies are eliminated. Also, because there are fewer nodes (participants) involved, it could take much lesser time than it would have in a public blockchain. In comparison to public blockchains, private blockchains are not as decentralized and there could still be a slight chance of the network owner making decisions and changes that could impact the users negatively. With public blockchains, every participant turns to trust the machine and its codes. However, in a private blockchain, all participants need to trust that each member will act according to the agreed rules. Looking at all the above developments, it is clear that blockchain in finance is not just a hype anymore but rather a reality. Banks are now joining the moving train and experimenting on how best they can make use of the technology in their operations. According to Cointelegraph, blockchain in finance is expected to be a 3 trillion dollar industry by 2023, up from its current 150 billion dollars. However, for this growth to take place, I strongly believe current and future financial institutions must be able to address issues pertaining to privacy, transparency, trust, transaction speed and fees. This, therefore, means for any bank or financial institution to remain competitive, they will need to implement this technology in their business proces. Regulations will still play a very vital role. However, it is also very important to note that the treat of cryptocurrencies to banks and the current financial structure is real. One of the biggest stumbling block cryptocurrency adoption is facing is unclear regulations. Should governments push forward with clear regulations, banks and other financial institutions might find themselves losing business to cryptocurrencies like Bitcoin. The IMF chief Christine Lagarde while siting the threat of cryptocurrencies, urged banks in November 2018 to create their own cryptocurrencies or risk losing their role. Nevertheless, cryptocurrencies still remain very risky and come with its own shortcomings. IBM has also been very prominent in the space. It recently partnered with a cryptocurrency blockchain company called Stellar in order to push forward with it’s IBM Blockchain world wire. 5 Ethereum mining pools with t..